Please send email to webmaster if there are other sites emphasizing Primghar Figure 8 Races. Primghar Jaycees on Facebook Pictures, current info? Race Day Prints (Chad Ebel) . Iowa Krazy 8 Racing Fanatics A thorough page with emphasis on central Iowa. Primghar Jaycee's Facebook Page (requires login to Facebook! The Rockford Files episode "Just by Accident" involved an insurance scam by some demolition derby drivers. 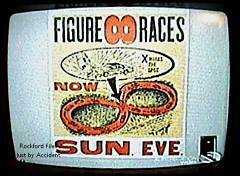 In one scene, in a driver's bedroom, there are race posters on the wall including one for figure 8 racing. View all Rockford Files on HULU! Assembled by ovk. Last updated 05/10/2011.